Well it certainly has been a real experience moving to the lone star state from the big apple. It's so interesting to see how different life can be when one moves south. Take today for example: we were wondering where to take the kids on Memorial Day. Anywhere I would take my kids in NY it was sure to be packed and whatever activity it would be, chances are it was a nightmare waiting to happen. 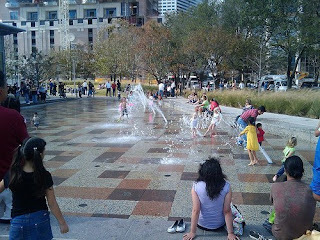 My wife decided to check out a local park downtown: Discovery Green Park. For starters the park is free and parking is very inexpensive (street parking is $1.25 an hr that accepts credit cards or $5 for an outdoor lot) and it has fantastic features for the little ones. We kept mostly to the outdoor sprinklers of which there where 2 different kinds. The one you see pictured here had fountains that popped up at various different intervals and strengths and the other was a big structure you simply sat under while the water rains down on you. All in all a very enjoyable outing. Unlike NY you could actually enjoy it ,even though there were people there you didn't feel like a pack of sardines.The next time you are in Houston make sure to check it out.